Duffy shot this for French Elle in 1964. The model is Ina Balke. 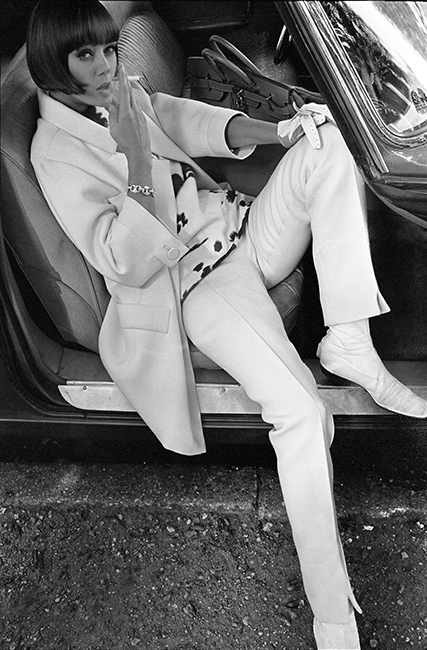 The white trouser suit is by Andres Courreges who was famed for his ‘space age’ fashion. The large holdall travel bag is the famed Hermes Haut A Courroies which first appeared in 1892 and went onto influence the design of the Kelly bag and thereafter the Birkin bag. Quote ref: EL_0982_10 if you require press information regarding this image.